An Actual Case Study of the new HolidayHotelReviews.biz video marketing. HHR builds and gathers 5 star reviews and animates as professional Holiywood style videos that engages 5 time more than tradition reviews and keeps guests on clients network longer with more conversion. 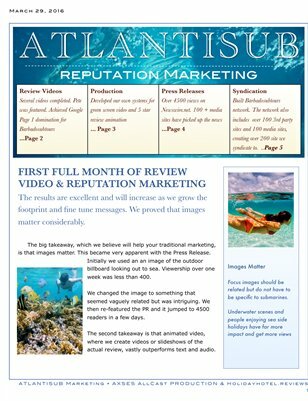 Actual results with Atlantis Submarines Barbados who were a first beta tester for the HolidayHotelReviews.biz reputation marketing launch.